BrowserShield cannot shield you in any way. This program only pretends to work as a beneficial security tool so that you would install it. Once it infiltrates your operating system, it will start injecting ads, and this is not something that should be associated with reliable security software. Even if the questionable program offers some authentic security services, we recommend deleting it because it cannot be trusted. If you think you know how to remove BrowserShield, we suggest reading this report first to learn more about this program and its activity on your operating system. Our researchers have found that BrowserShield can come bundled with freeware. Because several different installers could be employed for the distribution of this program, there is a risk of facing unreliable programs. Even if you think that it came packaged with harmless programs, it is essential that you inspect them using a trustworthy malware scanner. The mistake that computer users often make is that they do nothing after deleting BrowserShield. The removal of this ad-supported program is very simple, but, if you do not eliminate all threats, your virtual security will remain vulnerable. 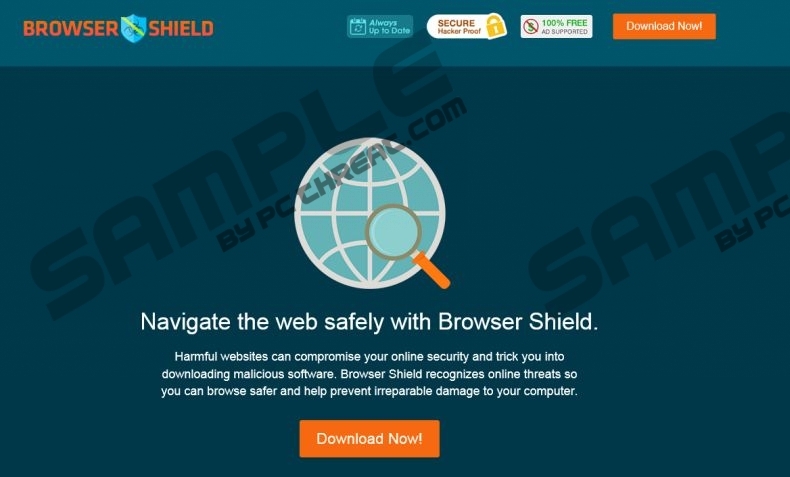 We identify BrowserShield as adware (advertisement-supported software) that requires removal because it could show commercial advertisements and pop-ups. Even if ads have not started showing up yet, it might be a matter of time before you encountered the first suspicious offers. Since clicking on any online ads – especially if they are associated with unreliable programs – is risky, you must be careful. If you have interacted with some of the ads, you need to think if your virtual security is now vulnerable because of it. Have you shared your personal information? Have you downloaded unfamiliar programs? Whatever the case might be, make sure that BrowserShield does not let in malicious programs. Internet Explorer is a browser that can be found on most Windows operating systems, which means that all Windows users could encounter BrowserShield. Even if IE is not your primary browser, you might have to delete BrowserShield from it. Our research team has found that users also might need to delete this browser extension from Mozilla Firefox and the older versions of the popular Google Chrome browser. If you employ a trustworthy, automated malware removal tool, you will not need to delete this browser extension yourself at all. We recommend using this tool to everyone, but particularly to users who find other unreliable programs installed along with this adware. Open the browser and tap Alt+F. Remove the unwanted add-on by clicking the trash icon. Open the browser and tap Ctrl+Shift+A. In the Add-ons Manager menu on the left click Extensions. Quick & tested solution for BrowserShield removal.